We've had a fairly mild winter this year (yay! ), so I haven't really been craving all the wintery comfort foods that I typically do. We've eaten a surprising number of salads and seafood dishes, and overall haven't been eating as many soups, stews, and braises as usual. However, this meal was definitely one that we thoroughly enjoyed (on a 60 degree day in January, at that). Chicken thighs are braised in a flavorful liquid of red wine, chicken broth, tomatoes, and thyme. Anchovies are also used, and while that may seem like a turn-off, I'd definitely discourage you from omitting them. They give the dish a great depth of flavor. 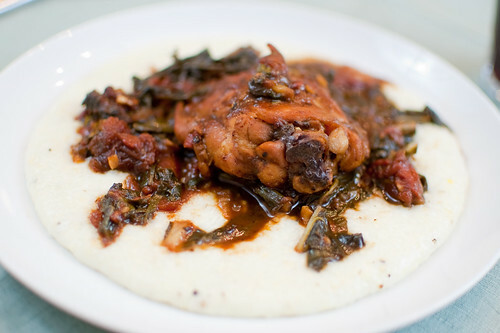 After the chicken is cooked, the swiss chard is cooked in the braising liquid, and a balsamic reduction is added to the sauce just before serving. I absolutely loved the combination of flavors going on. The tomatoes and balsamic vinegar create such a great sauce for the mild Swiss chard and the tender chicken. It was hearty, comforting, and filling, without being overly rich and heavy. 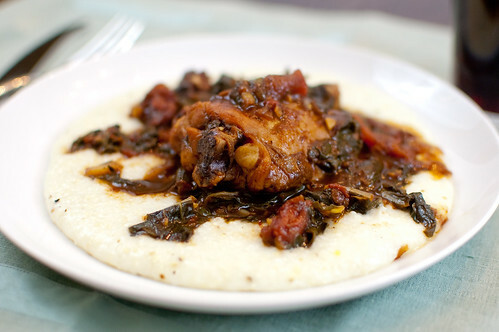 I served this over Parmesan cheese grits, but I think it would also be great with mashed potatoes, polenta, or rice - really anything to soak up the sauce. Adjust oven rack to lower-middle position; heat oven to 350 degrees. Sprinkle both sides of chicken thighs with salt and pepper. Heat oil in a Dutch oven over medium-high heat until shimmering; add chicken thighs skin-side down and cook without moving them until skin is crisped and well browned, 10 to 12 minutes. Using tongs, turn chicken and brown on second side, about 5 minutes longer. Transfer thighs to large plate. While chicken cooks, trim stems from Swiss chard. Roughly chop the leaves. Also while chicken cooks, simmer balsamic vinegar in a small saucepan over medium-high heat until thick, syrupy, and reduced to 1/3 cup, 3 to 5 minutes (begin measuring volume when vinegar begins to cling to sides of saucepan). Set aside. Using a slotted spoon, transfer chicken to plate and tent with foil; discard bay leaf. Bring liquid in Dutch oven to simmer over medium-high heat. Add chard greens and cook until wilted, about 2 minutes. Stir about 1/3 cup sauce into balsamic reduction to loosen, then stir the mixture into the sauce. Taste and adjust seasoning with salt and pepper. chicken thighs on chard, then spoon sauce over. Serve immediately. Note: I halved this recipe with no problems. I always stock up on good balsamic at Trader Joe's, so I just happen to be swimming in it at the moment. Adding this to the menu soon! It looks absolutely diving over those grits, girl. Oh, how I love this meal. Your pictures are gorgeous! It's still been soup central over here mostly because I'm always cold, no matter the weather so it's always soup season in my mind. :P I love the idea of this braise though. Balsamic just gets me every time. I know that my husband would love this dish for the anchovies alone. Thanks! I was just wondering what kind of changes I would have to make if I used boneless skinless thighs? This looks delicious! Maryam, I think you'd have to make quite a few changes, and even then you wouldn't really end up with the same dish. Boneless-skinless cook much quicker, so the 45 minute cook time would be unnecessary, though then you wouldn't get as much flavor from the sauce, etc. B-S chicken thighs cook very quickly, so I just don't think they would work well for this dish.